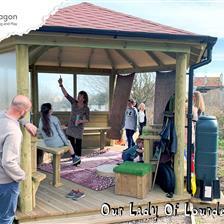 Pupils at Frodsham Manor House Primary School are enjoying a fabulous new Pentagon Multi Use Games Area in their school grounds, thanks to some brilliant fundraising initiatives from staff and pupils alike. Our Owner and Managing Director, Michael Bischof, worked with the Headteacher, Ian Devereux-Roberts, to see the project through to fruition. Michael visited the school to survey the grounds and discuss the school’s requirements. 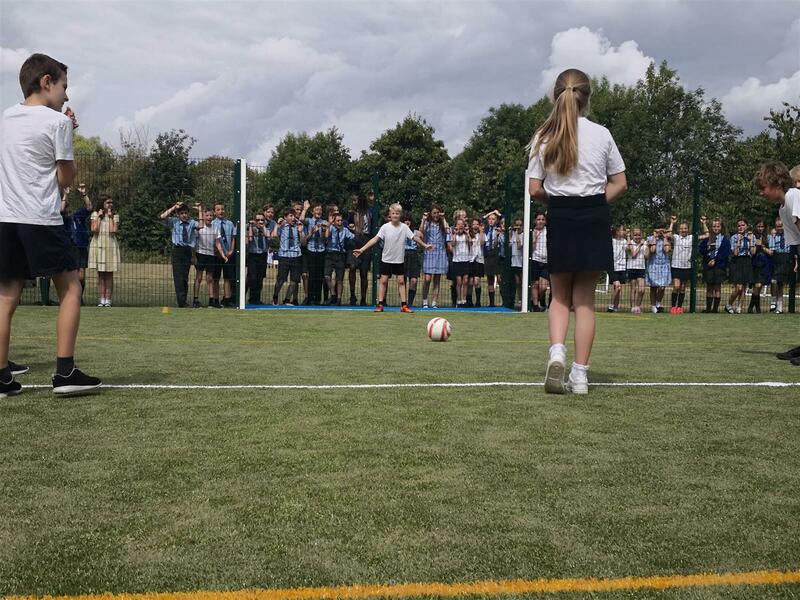 The school wanted their MUGA to be installed on the existing fields, with an easy-access link to the playground area. Our team began with the baseworks, preparing the ground for the installation. For excellent drainage, they back-filled the area with our 6” compact stone and sand dynamic base. On top of this they fitted our all-weather, multi-sport artificial grass surface, which has passed FIFA's rigorous durability tests. Yellow and white sports markings are clearly visible and facilitate a number of different team games on the pitch. 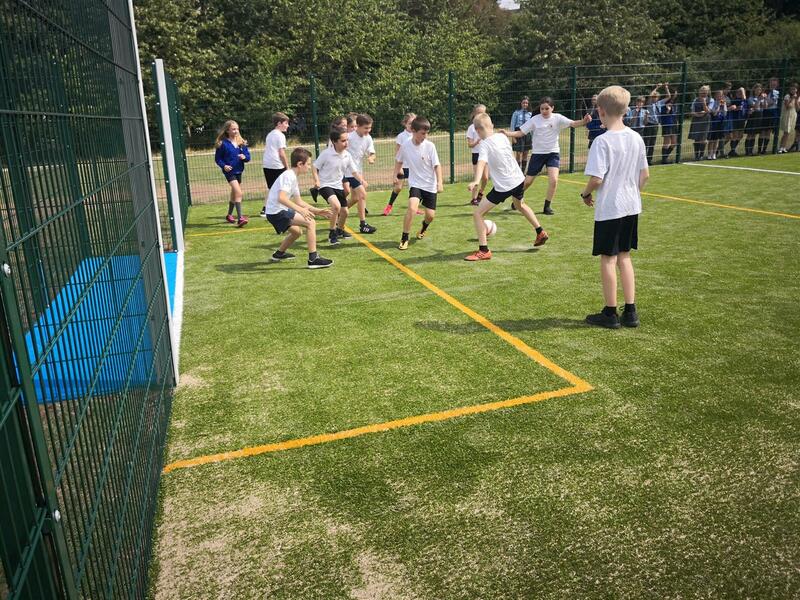 At each end we installed recessed goals with white goal posts, with one red and one blue goal surface at opposite ends - there can be no argument as to which team has scored a goal! The entire MUGA, which is built to Sport England's standards just like all of our MUGAs, was then surrounded by a 2m high rigid mesh galvanised sports fencing, powder coated in green. It has an anti-climb design so it’s safe and secure from both sides. And because it’s easy to see through, it allows spectators to stand all the way round the edge of the court and cheer on their classmates! 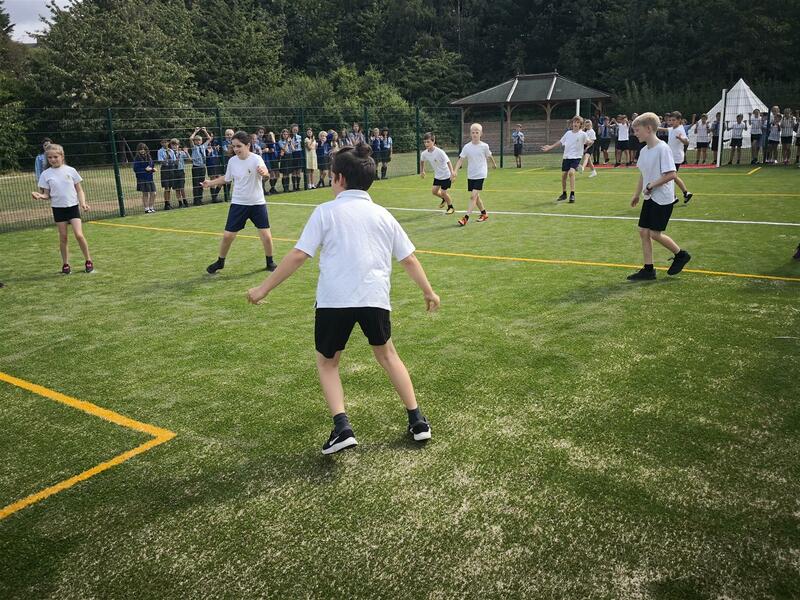 The MUGA at Frodsham Manor House is set on a beautiful big green open space. The school are delighted that they will now be able to benefit from this, and enjoy playing outdoor sports all year round. 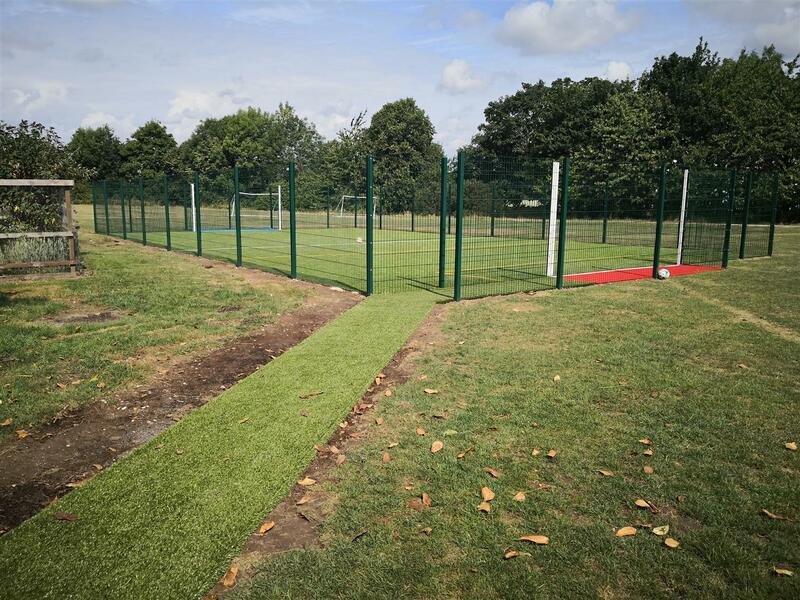 To create easy access between the MUGA and the existing playground, we installed an all weather artificial grass pathway linking the two together. It’s a whole metre wide so there is plenty of space for all of the children to walk along it without getting wet and muddy on the field. The walk-in area at the entrance to the MUGA is a brilliant handy space for leaving water bottles, bags and equipment during a game. 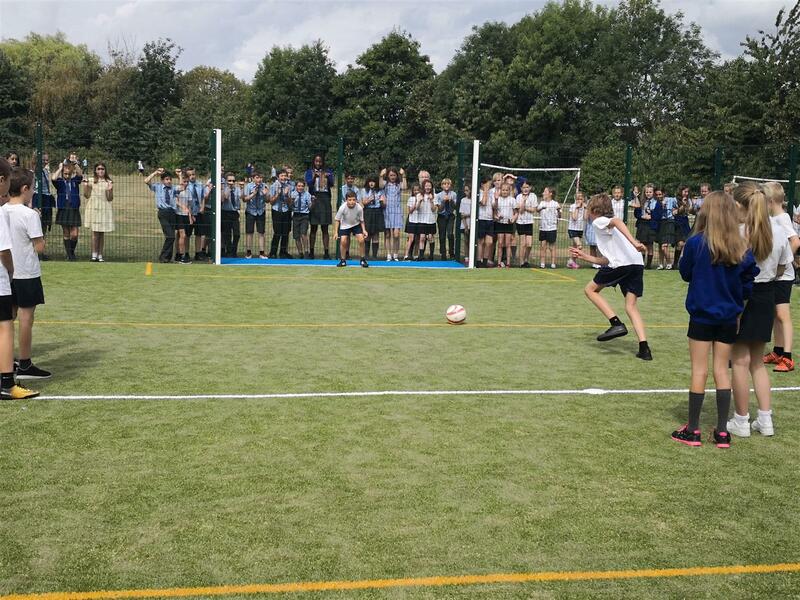 Mr Devereux-Roberts announced the grand opening of the new MUGA on the school’s social media. The staff and pupils enjoyed the special day with their Head Boy and Head Girl cutting a ribbon to declare the space officially open. There was lots of cheering and excitement from everyone! It’s a wonderful new sporting facility and something that will benefit pupils at Frodsham Manor House for many years to come. 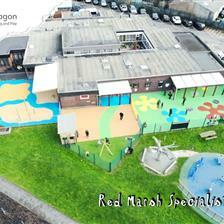 Pentagon Play’s Multi Use Games Areas can be designed and installed exactly to your requirements and we manage the entire process from design through to installation. 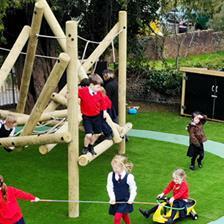 You can view our full range of outdoor sports products for schools here. 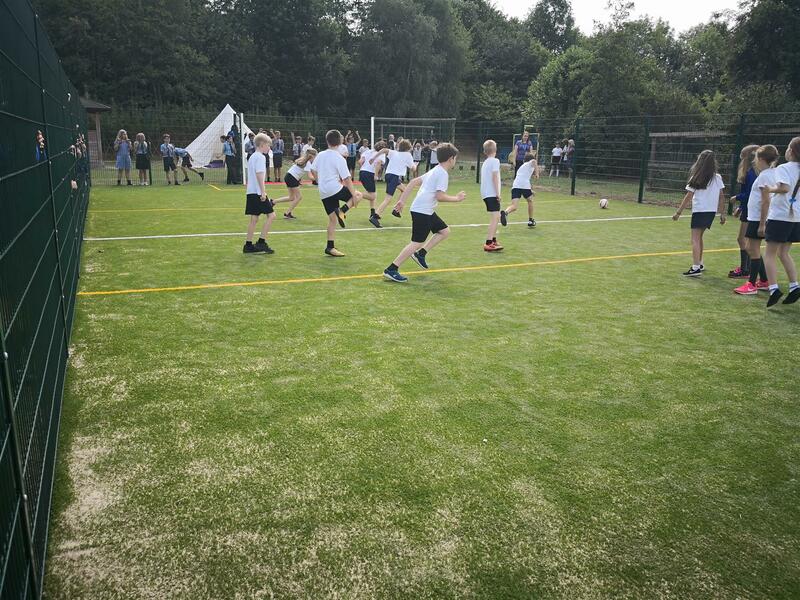 If you are looking to improve your sports facilities at your school, and/or if you are looking for long term and cost effective ways to spend your PE and Sports Premium, please do not hesitate to Contact Us Here to arrange a free consultation.